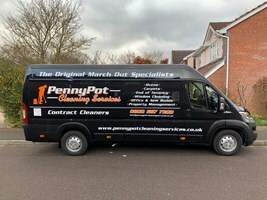 PennyPot Cleaning Services, is a company that prides itself on excellent personal customer service and provides a high standard of work. We have a wide knowledge of military march out requirements and procedures. MOD specialist Contract Cleaners, Cleaning catered to your needs. Leave the worry to us. Exceptional reputation with DIO and Army inspectors. 90% of our work is Military March outs with every clean inspected by a housing officer, this means that no matter what clean we carry out it is always to the highest standard. We also look after many company offices and a local school, suppling trained uniformed reliable staff. We also offer an all in one service for Letting agents and landlords, clean repairs & painting. Carpet cleaners are Ashby Enforcer, Prochem Five stars. Please click here to see our Facebook page.